Okay, so I'm totally cheating at Stacking the Shelves right now. I actually posted my Christmas haul pic on Sunday, but I ended up not getting any other books this week. (Yay! for the wallet. Boo! for the soul) And, since I didn't have a post for today, I thought I would just share my Christmas haul again. There was only one single book in this haul, plus two box sets: The Blood of Olympus and the new editions of The Infernal Devices and The Mortal Instruments series. I also got three Funko Pop!s: Katniss, Peeta, and Castiel. 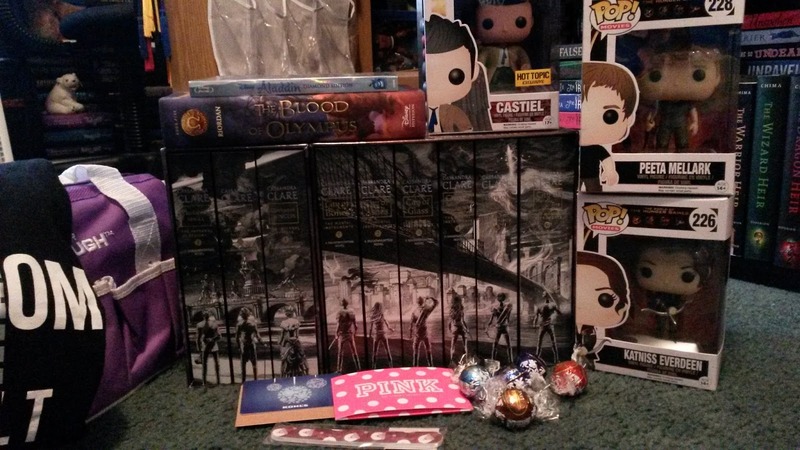 The other stuff includes (from left to right): a Supernatural “My Fandom is Better Than Your Fandom” t-shirt, a purple tool-kit, Aladdin on DVD, a Kohl’s and a Victoria Secret gift card, and some chocolate. All in all, Christmas yielded a pretty good haul this year. My mom also said she got me something else, but I’ll wait to share that in another post. What books did you get this week? Let me know in the comments. The Funko Pops are so adorable. Your box sets are lovely. I hope you love all your new books. wow, nice gifts!! Where can you get character Funko's they are sooo cute? Happy New Year! I think my mom and sis got them all from Amazon and ebay. I know there are some at Hot Topic too. Thanks for stopping by the blog and Happy New Year to you too!